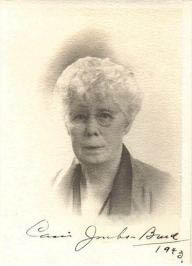 Fred Wasser reports on the life of Carrie Jacobs-Bond (1862-1946). She's the composer of "I Love You Truly," "Just a Wearyin' For You," and "The End of a Perfect Day." They were parlor music favorites in the early 1900s. "I Love You Truly" became a popular wedding anthem. 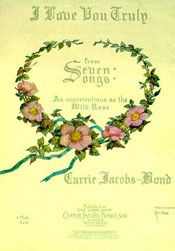 Although she sold close to 20 million copies of sheet music, Carrie Jacobs-Bond and her music are largely forgotten today. Sterling Holloway sings "The End of a Perfect Day" in Remember The Night (Paramount Pictures, 1940). The movie was written by Preston Sturges and stars Barbara Stanwyck, Fred MacMurray, and Beulah Bondi. “I Love You Truly” is part of the soundtrack of Frank Capra’s classic 1946 movie, It’s A Wonderful Life. The police officer and taxi driver serenade the Baileys on their wedding night. “I Love You Truly” is featured in the “Marriage License” episode of CBS television’s I Love Lucy. Original airdate: April 7, 1952 (Season 1, Episode 26).